Rare WW2 B-17 Bomber to visit El Reno as part of Memorial Stadium Rededication. EHS teacher Brian Rukes and his AP English 3 students, with the help of several others in the school district, have been working feverishly toward a major event which is slated to take place on the evening of October 4, 2019--the rededication of our Memorial Stadium football field. This will mark the 70th anniversary of the stadium which was originally dedicated in 1949 to the former El Reno students who served in World War 2 and gave their lives either during or as a result of their service. We are excited to announce that in conjunction with the unveiling of the new memorial that evening, a World War 2 vintage B-17 bomber will also be flying over the stadium just before kickoff of that evening’s football game. Even though fewer than a dozen such B-17s are left flying in the world, we have successfully scheduled the B-17G “Texas Raiders” of the Gulf Coast Wing of the Commemorative Air Force (C.A.F.) to be in town for the festivities. 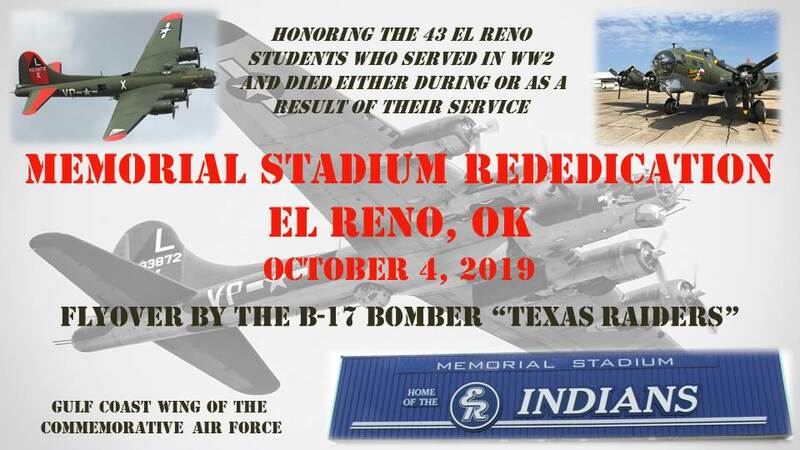 Having a B-17 bomber here for this event is particularly significant to us at El Reno Public Schools because nine of the 43 young men we are honoring with the stadium’s rededication were in B-17 bomb groups in World War 2. Moreover, a host of other people and families from El Reno had ties to the B-17 Flying Fortress bombers during World War 2. Even Leslie F. Roblyer, former ERPS Superintendent and long-time educator for whom our school’s Roblyer Learning Center was named, was a navigator in a B-17 during the war. Click here to read the biographies of the servicemen. The B-17 “Texas Raiders” will not just fly over the stadium as part of the rededication ceremonies, though. It will also be parked at the El Reno Regional Airport from October 4 through 9, 2019, where it will be available at specific times for ground tours. (You can literally walk and crawl through the aircraft, see the different positions of the 10-man crew, and even hold on to the .50 caliber machine guns in the waist gunners’ positions.) Even more amazing, rides in the aircraft will also be made available. This is truly a tremendous opportunity to experience a part of what so many El Reno sons experienced in World War 2. Make plans to be at ERPS’s Memorial Stadium on October 4, 2019, and get a thrill like none other--a four-engine B-17 bomber roaring over the stadium, helping us honor those who paid the ultimate sacrifice. And then come out and see the bomber in person at the airport--and maybe even get to fly in this amazing piece of history! To watch a video of the Texas Raiders click play below.